What does Manchester United stand for? The United way. The Arsenal way. The Liverpool way. It is one of the most recognisable clichés in the colourful vocabulary of the football fan. Bandied around in equal measure both in times of prosperity and hardship; supporters will either revel joyously in witnessing the game being played “our way”, or pine for its return amid periods of despair. Its usage often extends no further than being an attempt to distinguish ones club from another, to establish a stylistic superiority over a perceived inferior rival. Yet, despite becoming a somewhat platitudinous statement, it remains vitally important to fans. And rightly so. The sheer longevity and success of Sir Alex Ferguson’s 26 year reign at Old Trafford has allowed United to establish this identity in a way seldom witnessed elsewhere. It is not uncommon for the words “empire” or “dynasty” to be used liberally when describing Ferguson’s tenure, and it is because of that unrivalled sense of self that he developed within the club that its sudden disintegration has been all the more pronounced. It is telling that the biggest critics of Louis van Gaal’s increasingly vague philosophy are those who formed the backbone of the Ferguson era. Paul Scholes, Gary Neville, Roy Keane, Rio Ferdinand – these were the players who brought their manager’s vision to life on the pitch, and as much as their negativity has become repetitive, it clearly pains the quartet to watch the club’s ethos fade away. However, the identity crisis that has now enveloped the club had taken root before Van Gaal, or even David Moyes, arrived. In his twilight years, Ferguson infamously allowed United’s midfield to fall into alarming disrepair, overseeing the departure of Paul Pogba, whilst the likes of Anderson continued to command a considerable wage. It is also easy to forget that in the final few seasons under the legendary Scot that, despite reaching a Champions League final in 2011, the quality of football on display bore little resemblance to his two truly great sides that won the competition in 1999 and 2008. The euphoria of a 20th league title in 2013 papered over cracks that had been visible for some time. Crucially, though, the drop in the overall calibre of play never precipitated an abandonment of United’s attacking principles. But Ferguson did choose Moyes as his successor. It was a decision that will be analysed, dissected and analysed again for years to come – forever remembered as the moment that catalysed a chain of events leading United into this period of depressing uncertainty. Perhaps Ferguson saw something of himself in Moyes, a Glaswegian who had paid his dues at Everton over an extended period. It was a romantic notion, but ultimately a misguided one. Moyes proved woefully inadequate in carrying on the traditions laid down by his illustrious predecessor. Sacked within a year, the idea that he should have been afforded time to grow into the role holds little credibility. Had the former Everton boss maintained even a mildly acceptable standard during his disastrous nine months at the helm then perhaps he would have been deserving of some patience – a seventh place finish fell way below that particular threshold. It is arguable that achieving the minimum standard is perhaps the only area that currently distinguishes Van Gaal from Moyes. The Dutchman has, to use the phrase of the moment, “steadied the ship”. The issue with that particular analogy is that the majority of United fans have never known their side to be a steady ship, nor do they want it to be. The terraces are used to accompanying their team on swashbuckling adventures, not meandering listlessly from match to match. Yes, it is undeniable that United needed a period of stabilisation post-Moyes, but a manager of Van Gaal’s pedigree should be providing so much more than is currently on offer. For a man so obsessed with the idea of philosophy, he has shown little regard for the identity of the club that entrusted him with the task of self-rediscovery. Some have argued that Van Gaal is simply making do with the inadequate tools at his disposal, deploying a conservative system to compensate for the deficiencies in the squad. But is that really an acceptable defence considering the money that has been spent on new players since the Dutchman’s arrival? Despite that eye-watering financial outlay, Van Gaal’s United continues to play a woefully uninspiring brand of football. Blooding youngsters, such as Jesse Lingard and Andreas Pereira, is spoilt by the bizarre treatment of others – Adnan Januzaj and James Wilson. United have lacked a player of Januzaj’s directness, and although he would likely be no more than a backup, the lack of goals being scored makes Wilson’s loan move to Brighton & Hove Albion seem more than a little odd. By all accounts, Van Gaal’s methods encourage a rigid, mechanical style of play – completely at odds with everything that is held traditional at Old Trafford. It is futile to continue longing for the halcyon days under Fergie, as his like will never be seen again, but it is not unreasonable to expect continuity of attacking traditions that he established. Instead, Van Gaal has become so fixated with dominating possession that scoring a goal has almost become an afterthought. The result has been an exasperating volume of goalless draws, a somewhat alien concept to United fans. The style of play appears the very antithesis of supporters’ perception of the “United way”, and there is a distinct impression that the fluctuating results would be less exasperating if there was simply some modicum of entertainment. Furthermore, many players simply do not seem suited to Van Gaal’s formulaic approach. Juan Mata, Ander Herrera, Anthony Martial and Memphis Depay will likely never adapt fully to the robotic style of play. It is obviously not in that quartet’s nature and together they possess enough talent that it seems folly to ask them to play in such a fashion. Whether these players are truly capable of re-establishing United as an attacking force remains to be seen, yet they deserve to at least to have their shackles removed and be permitted to follow more natural attacking instincts once more. Van Gaal brought United back from the brink of meltdown last season, and for that he should be commended, but for a club of this stature that alone is not enough. There has been a smouldering dissatisfaction among the support this season, tempered only by the club’s promising league position. However, the disastrous Champions League exit in Wolfsburg has fanned flames of frustration – at just how unrecognisable United has become. Defeat at Bournemouth on Saturday has exacerbated this sentiment. Ironically, the fire that Van Gaal must now surely notice rising steadily beneath him may only be extinguished by throwing his safety first approach out of the window. In a relatively short space of time United have become a club that has lost sight of itself. The longer the identity crisis continues the harder from which it will be to recover. The “United way” risks becoming nothing more than a memory. How come the cheapest PL & least experienced players & the worst teams can piss on MUFC? Sir Alex knew Attack is the best defence! This is as far as he goes. Time to move on. Bingo ! These four players are being forced into a straightjacket so that their potential is thwarted. The question is this: is Fergie’s attacking tradition a viable long-term strategy in today’s game? Did Barca’s or Bayern’s Champions League wins not teach us that something else is superior? Wasn’t LvG part of the reason for these club’s meteoric rise in World football? Add to this, very few top teams play like United used to under Fergie. Gung-ho games end in 6-1 losses to City. Defense is the future of football, I think. Therefore, I am willing to put up with LvG for 16 more months to see how he can turns defense into gold — it’s what he has done before. In that process, attack will be fixed too. That said, anything outside of the Top 3+title challenge or Top 4+Cup win in May will be cause for firing in my book. Fixing United is like repairing a Boeing 747 while it is in flight. If he keeps us flying high enough, I am satisfied. What some of us feared all along has turned out to be true. The emperor has no clothes. 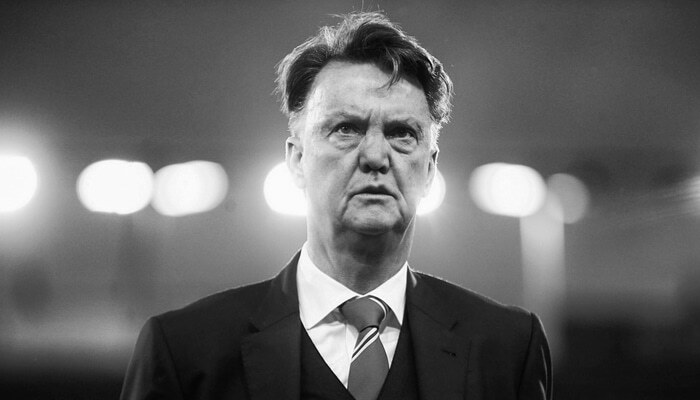 Aloysius, Paulus, Maria, “Louis” van Gaal is naked and it’s not a pretty sight. He has nothing with which to cover his embarrassment. The notion that the boss was wearing a new tailor-made set of threads, ready to set fashion trends for United’s future, has turned out to be an illusion. In our hearts we wanted to believe but our eyes have been telling us a different story. That United do not have a “divine right” is obvious. However, LVG’s accusation that fans live in the past is feeble-minded. We know there was poor and under investment in the late Fergie years. The last team that won the title wasn’t very good. We know that integrating new players into a team is not straightforward, especially with so many at once. We know there had to be a massive clear-out of dead wood and that mistakes were made letting good players go. We know Rooney needs to be offloaded pdq. We are aware of the promise of Martial and Depay. But … we hate LVG’s “pragmatism”, his imposition of crab football to stifle gifted players. We fail to understand his tinkering with formations and his weird substitutions. We don’t actually think he has a “philosophy”, more a ramshackle basket of half-baked ideas (particularly about himself) that went out with the ark. Woodward has also been repeatedly found wanting. United’s reputation has taken a dramatic nosedive, attributable to these two numpties. “Schadenfreude” is everywhere in the press and online. In my view there are too few not too many links left with the glory days. LVG doesn’t understand the deep emotional attachment of United fans to the club and their awareness of its history. It’s not a matter of living in the past. We simply want to approach the future optimistically, excited by a creative approach that keeps the unique United ethos alive. I have no doubt that United will rise again to occupy the pinnacle of English football. This “shall” not happen with LVG in charge. It’s nothing to do with “divine right”, nor do we don’t need a messiah, just the right man at the helm. One point that seems to have escaped (or been over-looked) is that in the last two matches (Wolfsburg/Bournemouth) is that four of the five opposition goals were scored from free-kicks/corners. Or, to paraphrase, to give away one such goal is unfortunate but four is just shoddiness. “A didsastrous exit in the CL has fanned a flame of disappointment”. May i remind you we also had a disastrous exit in 05/06 haven scored only 3goals in six matches with had team that had VDS, RVN, Giggs, Scholes Rio, young Ronaldo and Rooney. We were rebulding then as we are rebuilding now. Many wrote off the likes Ronaldo, Fletcher, Rooney even Rio and Evra as not good enough, but three yrs down the road they were lifting the CL. Yes we exited from CL, but these young player like,Depay, Lingard, Periera, Martial Mcnair, will learn from it and become better players. We may sack Lvg, but some years down the these players will be greatfull to him as Xabi, Iniesta, Puyol, Muller, Bastin, Alaba, kluivert, Seedoff,Kanu, to mention but a few are today for trusting them while others didn’t. The irony of it is Lvg may not be around to reap the friut of his labour. LvG’s insertion of Powell in the last two matches – as well as his decision to keep Powell while loaning-out KidWilson – seems odd but I wonder how we would look at matters if we give the manager’s decisions the benefit-of-the-doubt. The manager sees these guys in training – as well as the next generation which seems to have a few really exciting prospects (Goss, Tuanzebe, Rashford, Fosu-Mensah, and Williams). A lot has been made of LvG’s stubborn adherence to his philosophy but perhaps just as much attention should be paid to his long-standing willingness to trust kids, going all the way back to his time at Ajax in the mid-90s. If we stand back from the immediate disappointment of the past fortnight, one thing stands out – it’s a “New United” on the pitch. Assuming that LvG will not be fired for a bad run of results – and some pretty dire displays – a glass-half-full view would suggest that next year’s squad will be younger and composed of home-grown kids. One other thing to keep in view – as I noted above, in the past two matches there were four goals scored by the opposition on set-pieces BUT all of them were the result of break-downs by veterans (Smalling/Carrick v. Wolfsburg and DDG/Blind v. Bournemouth). It’s not a matter of v Gaa trusting kids, it’s more the fact that once he had chopped the squad back to the bare bones and the inevitable mid-season injuries arrived, then kids are all that he has left. Know it all v Gaal underestimated the depth of squad required to compete at the top in the P.L. as well as for competing in three cup competitions. If he really cared that much about kids he would have done a better job with Januzaj and Wilson. The only players that I would have kept are DarrenFletcherinho and Chicharito; both offer something that is completely lacking in this squad – Fletcherinho offers guts and memories of glory while Chicharito offers goals. Neither AdnanJ nor KidWilson did enough to stick around – Januzaj’s loan to Dortmund is something of a disaster (reminiscent of Giovanni Rossi’s time at Newcastle) because he’s stuck behind four or five better players. Like Wilson, Januzaj should have gone to a team that actually needed him and would have given him game-time. ‘Neither AdnanJ nor KidWilson did enough to stick around..’ -Balderdash, Davey boy. Januzaj’s problem is that he likes to get the ball, head towards goal, beat a player or two and create a chance and score. just like he did against Villa early season. How dare he! Dribbling forwards and taking a risk, whatever next? Forget his raw talent and potential, just banish the upstart from the kingdom. What a waste. James Wilson did well under Giggs but as soon as he found himself competing with United’s version of the Galacticos – Falcao, RVP, Rooney and Di Maria, he struggled, mainly because the fabu-less four wouldn’t give him the ball – presumably in case he showed them up. Come this season and he just about disappeared from trace playing second fiddle to the undroppable first fiddle. Don’t disagree with the remainder of your last paragraph.The Rossi parallel is a good one. Fergie’s mistake was in not getting him back asap. I just can’t agree about Adnan – sure, he scored that goal against Villa but, mostly, he was too slow and his play lacked penetration and/or vision. But, hey, that was just my opinion, formed by watching his play from my chair – in Toronto – on the telly. I have heard people talked about the players LvG let go. Out of the lots, only chicharito is playing well. That said, what is required to playing well for leverkusen is not the same @ United. The expectations and the pressure is higher @ United. We know how kagawa struggled even under SAF. Bastian is still strugling with all his experience. Most of the so called average players @ United will be stars in other clubs in other leagues. And as for Januzaj, its a shame he is ok to be a squard player in Dortmond than to stay @ United. Lvg does not need injuries to trust young players rather he releases older players to give room for younger ones as he did in Ajax, Barca, and Beryern when he moved on Denis Becharmg, Subizereta, Pep Guadiola, Histo Stiochof, Luca Toni, and a host of other players to give kluivert, kanu, Rezigal, seedoff, Puyol Xabi, Iniesta, Valdes, Bastian, Larm Muller, Alaba their opportunities. Like i said in my earlier post, some yrs down the road many of these young players will be crediting him for believing in them when you and i didn’t. ‘…….some yrs down the road many of these young players will be crediting him for believing in them when you and i didn’t.” – I understand your sentiment but I disagree with your rationale. It’s not about whether you or I believe in any particular young player or not. In this era, when football is corrupted by finances, all fans not just United ones, though especially United ones, love the idea of a fresh-faced kid coming through, breaking into the first team, perhaps displacing an ageing, overpaid scouse pie-eater. it makes us feel good, it takes us back, it waters down the cynicism. If LVG decided to play the entire U21’s team in the home game against FC Midtjylland there would be 75,000 Reds cheering their heads off. We love kids! It’s not about the kids. It’s about van Gaal. It’s about his methods, his tactics and his philosophy. His supporters can talk as much as they like about rebuilding and needing time but neither of these has anything much to do with the fundamental style of football served up to the fans.